NEW YORK—Have you ever wondered why some watches are more expensive than a Ferrari? They are luxurious not because they pay a lot of money to celebrities for marketing. They are complex timepieces, requiring generations of experience and big investment in research and development. A watch exhibition can be a good platform for better understanding the complexity behind making excellent watches and for appreciating the stories of world-class brands. WatchTime Magazine held such an exhibition at Gotham Hall in New York, on Oct. 23–24, drawing more than 700 timepiece enthusiasts and collectors. They hosted 20 luxury watch brands from Switzerland, Germany, the United States, Italy, and Japan that displayed their newest timepieces. 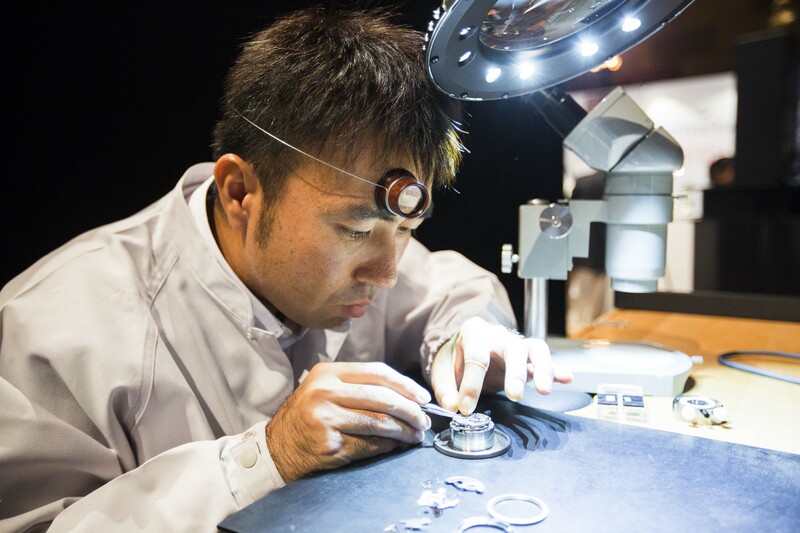 Over the course of two days, guests had the opportunity to see watchmaking demonstrations, try on luxury timepieces, and chat with company executives who were excited to showcase their brands. “America is a huge and interesting market for us. People like German products and the designs,” said Thilo Mühle, CEO of German watchmaker Mühle Glashütte, founded in 1869. “What I love about Americans is that they are very energetic and enthusiastic. A lot of people like our watches,” said Merlin Schwertner, Vice President of NOMOS Glashütte USA Inc., another German brand featured at the event. One of the luxury brands featured at the exhibition was Pierre DeRoche from Switzerland. “My family has been in the watch business for four generations,” said Pierre Dubois, the founder and the CEO of Pierre DeRoche. 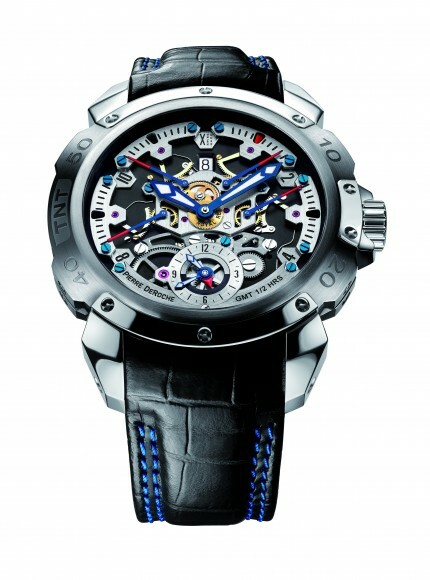 The brand has unique complications that display additional functions like date, and power reserve. TNT Royal Retro watches are the best examples that feature these complications with six retrograde seconds hands. Another unique aspect of the watches is its chronograph, which is a stopwatch function that measures intervals of time. “All our chronographs have a 60-minute counter. Whereas, most Swiss watches have only a 30-minute counter,” said Dubois. Pierre DeRoche also has watches that are designed for the Asian market. “Chinese people still prefer simple designs and small round cases,” said Dubois. The simple designs are sold for $7,000 and the steel case watches with Royal Retro complications are sold for $22,000–23,000. The brand also has watches with special metals sold for $320,000. The small East German town Glashütte is the birthplace of world-famous German watch brands. Fine timepieces have been made there for almost 170 years. The watchmakers in this town have thrived since the fall of Berlin Wall. One of them is NOMOS Glashütte, which is a fully independent watchmaking company. It exports to 43 countries and launched its U.S. business in mid-2014. NOMOS watches are all equipped with in-house movements; the latest, an ultra-thin automatic caliber, the DUW 3001, was introduced in the neomatik series. The NOMOS brand has a quite a unique approach to design, as well. “Our watches stand out with their combination of high-quality craftsmanship from Glashütte, and timeless design from Berlin, which is where our in-house design studio is based,” said Merlin Schwertner from NOMOS. The company has been around for 25 years, with some of its models already being considered classics. Another aspect that stands out in a NOMOS Glashütte watch is its proprietary escape assembly, the NOMOS swing system; a crucial watchmaking part that defines the accuracy of a watch. By doing so, NOMOS Glashütte has made itself independent from external suppliers, and can now control all aspects of quality itself. According to Schwertner, NOMOS watches are “affordable luxury”—with prices ranging between $1,400 and $6,000. Another brand from Glashütte, Nautische Instrumente Mühle was founded in 1869 to manufacture precision measuring instruments for the watch industry. After the fall of Berlin Wall the company was re-established and since then has focused on nautical instruments, marine chronometers, and mechanical wristwatches. The brand makes unique nautical wristwatches. Its Rescue-Timer watch is among the most popular. The watch has been designed with the help of the German Maritime Search and Rescue Service. Mühle has been in the U.S. market for seven years, and its prices are in the range of $1,600 and $5,000. A. Lange & Söhne, also from Glasshütte, was founded in 1845 and is currently owned by Richemont SA. The movements of Lange watches are made from a metal known as “German silver,” as opposed to the plated brass typically used for Swiss movements. This gives Lange movements an unusual color and sheen. The price for Lange watches starts from $16,000 for very simple complications and goes up to $2.2 million. Another prominent brand at the exhibition was BALL, which is an American owned brand, headquartered in Switzerland. BALL Watch Co. was established in 1891. After a horrific train crash in the United States, the company was commissioned to establish accuracy and uniformity in timekeeping on U.S. railroads throughout the country. “People love the history and American aspect of the brand,” said Wes Burke, who is marketing manager of Duber Time, the U.S. distributor of BALL watches. The most unique feature of the brand is the self-powered micro gas tubes. This technology makes the watch glow at night, so one can read the watch quickly and easily in any environment. The entry-level price for BALL brand watches is around $1,500 and for the gold pieces the price goes up to $17,000. The medium price point is around $2,400. Japanese Seiko showcased its luxury brands, Grand Seiko and Astron at the exhibition. “In the U.S. market, we are behind the Swiss watchmakers, so our biggest challenge is to catch up to the Swiss brands” said Ken Irie, senior vice president of Seiko America. The most important feature of Grand Seiko is its “spring drive movement,” which is an in-house technology. Established in 1964, Grand Seiko entered the U.S. market in 2010. Prices of Seiko’s luxury watches range between $1,000 and $17,000. Porsche Design has been in the watch business since 1972, but the company preferred to work with license partners like IWC. Porsche design founded its timepiece company last year in Switzerland and started producing watches in-house. “We focus on clean functional designs,” said Kerstin Hamann, head of marketing at Porsche Design America. Porsche Design has 25 stores in North America. Prices of the collection range between $3,500 and $8,000. Other luxury watch brands featured at the exhibition included Armin & Strom, Bell & Ross, Blancpain, Moritz Grossmann, Breguet, Carl F. Bucherer, Emmanuel Bouchet, F.P. Journe, MeisterSinger, RGM, Tutima, Ulysse Nardin, and Visconti. Having received positive feedback from watch collectors, WatchTime Magazine plans to hold its second New York show in 2016. “We plan to attract more established brands. Our goal is to grow the show next year,” said Sara Orlando, publisher of WatchTime Magazine. Learn why the amazing sculptor moves his hand only between heartbeats. A watch worth over half a million attracted unwanted attention for a Putin's Aide.